Over the summer, I spent two weeks in Austin, then a few days back here in SoFlo, then joined my husband in his former home of New Orleans for a four-day work trip. Austin is the fastest growing city in the United States, and I can see why. It’s full of Texas charm laced with live music, barbecue, and taco trucks. To satisfy the influx of new residents, Austin floats at the top of the trends. South Congress St. is sprinkled with cupcake shops, thrift stores, and fashion boutiques. It’s shiny and clean and declares its sense of coolness as you walk by. I found the hipsters to be friendly and helpful and I left thinking Austin was a great city to visit. Looking back, the highlight was seeing Cyndi Lauper perform the entire She’s So Unusual album live at Stubb’s Bar-B-Q. That venue was real Austin; the rest of my memories have to do with the other transplanted journalism advisers who were there with me. Now in my rear view mirror, Austin feels more idealized and less alive. It delivers what’s advertised, but for me it’s too much image, not enough heart. In contrast, New Orleans’ tourist campaign promises debauchery and a history lesson, but the reality is less beads and textbooks, the truth as thick and murky as the Mississippi. While the Colorado River in Austin is clean enough to kayak and swim in, the muddy Mississippi, heavy with silt, leaves you clinging to your seat on the ferry. Walk west from the riverbank to the Marigny, and you’ll see people sitting on their porches and chatting up walkers-by. People know their neighbors here, the neighborhood that houses the Bed and Breakfast where we stayed. It’s also the neighborhood that’s escalated in property value the most since the storm. During our three night stay, we walked regularly down Frenchmen St., home to at least 10 live music venues, most of which host jazz. While Austin claims to be the live music capital of the U.S., I learned the focus was more quantity over quality. A guy + a guitar singing pop music covers equaled “live music.” Every single band we heard on Frenchmen St. injected life into traditional jazz and stirred the dormant loneliness in each of us. The loneliness that once you feel it, makes you feel connected to everyone in the room. Louis CK recently called it our forever empty. On our first night in NOLA, we ate dinner at local favorite Adolfo’s, a Creole-Italian upstairs nook that only accepts cash. On our way in, we ran into an attractive couple also dining there. He smiled and apologized for his girlfriend who was glued to her phone and stopped in the middle of the stairway, blocking our passage. Later we watched him dine with friends without her. The next night he stood next to us at the Balcony Music Club while we listened to a woman sing Sade. Just 24 hours later, we heard him joking with his buddies at the bar at the venue Vaso. The night before at the same club, we talked to a man with a cognitive disability who we had trouble understanding; that man was now playing trumpet on stage with a brass band. After the song ended, our jovial guy at the bar headed for the stage and took his normal place with The New Orleans Swamp Donkeys. He’d simply given stage time to that gentleman; this was his band, and he was the star trumpet player. That is the beauty of NOLA. Four days in the same neighborhood and we were a tiny part of that community. Aaron felt that way when he lived there, and for the first time I understood exactly what he meant. The community builds around ruins, around cobbled streets many tourists perceive as dirty. The roads and sidewalks in New Orleans burst with tripping hazards: potholes, cracks that become near ravines, and ever-shifting pavement. They say the city is sinking. The dead cannot be buried in the ground because of the high water table. People who can afford it have loved ones buried in above-ground mausoleums that house several family members. 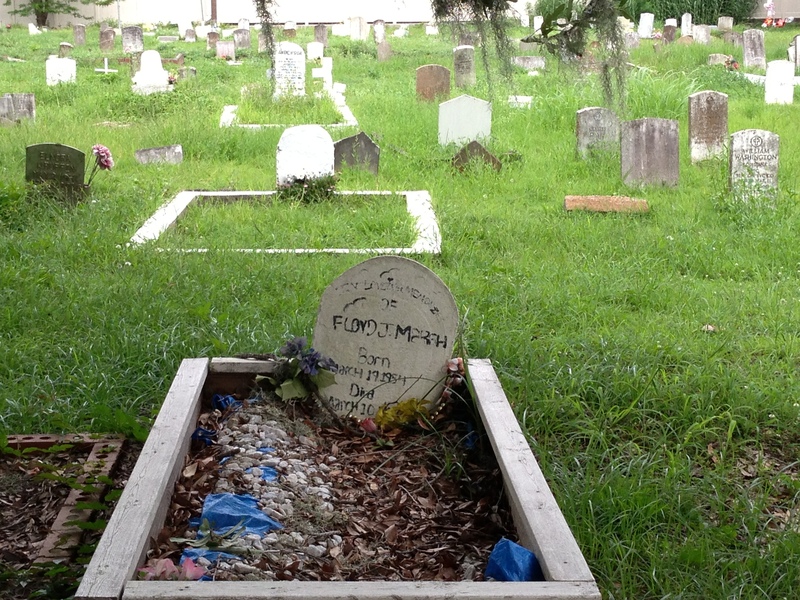 Once the body of one decays and the remains settle to the bottom (which happens quickly in NOLA humidity), another family member can be added to the top. The dead do not stay buried here. 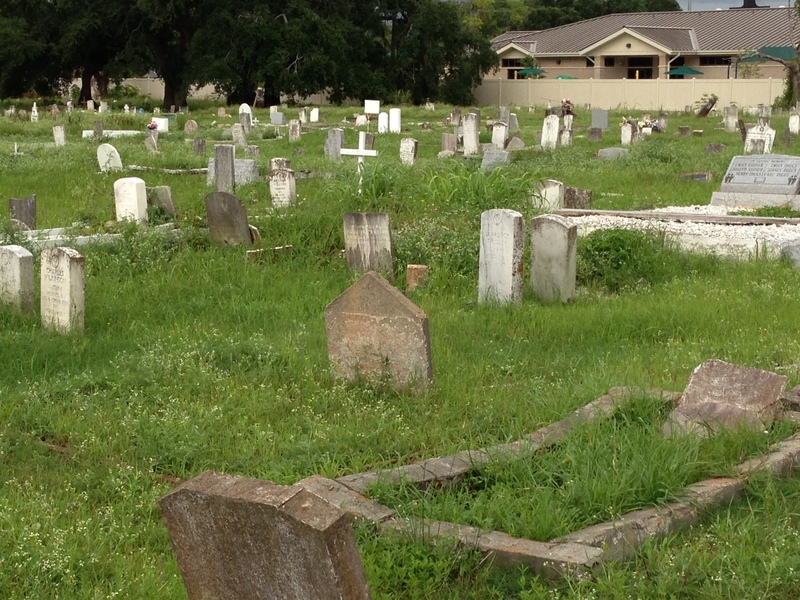 My husband took me to what has been deemed a “pauper’s cemetery” or a makeshift public burial ground for those who cannot afford the large stone tombs or community mausoleum plots. 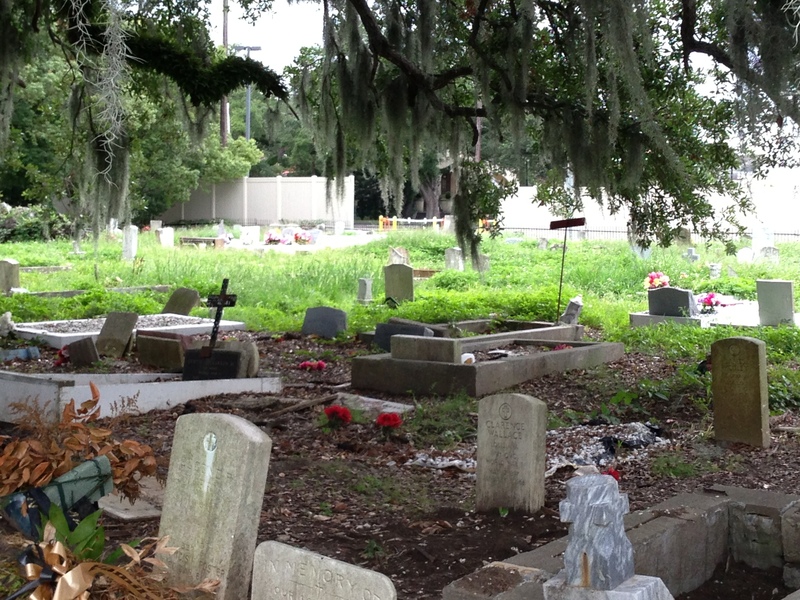 You walk through overgrown grass and weeds and handmade grave markers, stones sinking into the earth. You see messages of love and tribute scrawled in Sharpie on a hand-forged cross and a tree stump with a hand-carved epitaph. Synthetic flowers garnish mulch, rocks and garbage bags that house loved ones’ remains. The oaks send down arms of moss to cradle these graves. 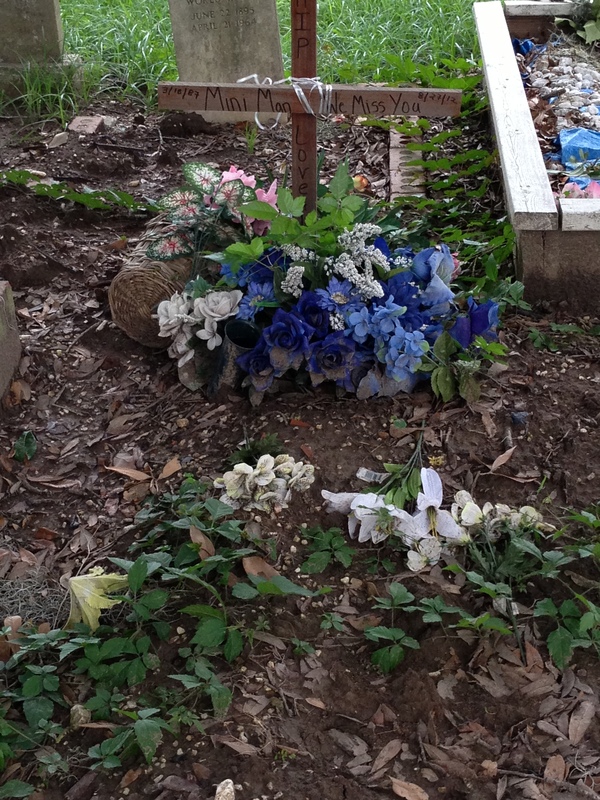 Walking through this cemetery you feel the love and loss at its rawest surface. That’s how everything in New Orleans feels. Charmaine Neville, who survived Katrina’s flood on a roof top, spoke to the crowd at Snug Harbor as if she held her community inside her raspy voice. On the night we were there, she called up a stone-faced 14-year-old girl to play bass with the band like a pro. The 17-year-old boy next to us filled in on drums. Sister to the famous Neville Brothers, Charmaine wants to share her stage with young people. She urged a 16-year-old from Seattle visiting with a volunteer group to come down and sing with the band, but she was too nervous. “We start young here,” she said, after noting the drummer started playing at 5, the guitarist at 7. Charmaine did her best to make the 16-year-old comfortable. She encourages anyone in the audience with musical abilities to be on stage with her. She has the way of making everyone feel a part of her show, just like her city takes you in and makes you its own. People in Austin complained about the humidity, but I didn’t get it. Compared to the rest of Texas, it’s steamy I guess. On July 11, Austin was 100 degrees with 25 percent humidity. Meanwhile in New Orleans, it was 78 degrees with 90 percent humidity. Here at home it’s regularly 90 degrees in the summer, but the humidity can vary. You never completely accept the unbearable days. In NOLA, the high humidity hovers and residents have no choice but to settle in. To accept the swamp. When connecting with a community is a choice, it’s easy not to choose. Something about the humidity in New Orleans hangs on you, the ghosts of its past, the struggles of its present. Even as a visitor, you start to embody it. The tourist campaign for the city promises a party, and if you never leave the French Quarter at night, that might be all you find. But if you spend a few days in the real neighborhoods of the Crescent City, you’ll find the community is a living organism that rises despite its geography. Despite the river that tries to swallow it. To live there requires one to connect and to create. The image outsiders have of the city is a lie. The truth is dirtier than Austin, but it’s real. You can tap into the arteries that lead to the heart of New Orleans. In Austin I was just looking at a pretty face.